The warm weather we have had this summer has given us a bumper crop of tomatoes, especially cherry tomatoes. We aren't eating them as fast as they ripen, so I've been making the easiest tomato sauce even and freezing it. I love that this sauce doesn't require any peeling or seeding of the tomatoes. Your food processor or blender will take care of all those. There is really no recipe here, but here's how I make it. 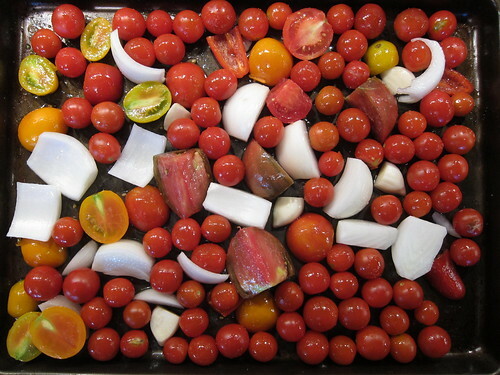 I fill a baking sheet with tomatoes, one large onion and one or two large cloves of garlic. I keep the cherry tomatoes whole, but quarter or half any larger one. The onion gets peeled and quarter. The garlic just gets peeled. Then I drizzle everything with a generous amount of olive oil. Mix it up so everything gets coated. The whole tray goes into a preheated 350 F oven for 30 - 40 mintes. You want everything to be soft and the onions should just be starting to turn brown. I let the tray cool a little bit and then put it into the blender, make sure to get all the juices and brown bits. A quick processing will make it completely smooth. Then I taste for seasoning. I usually add some salt, pepper, basil and oregano. 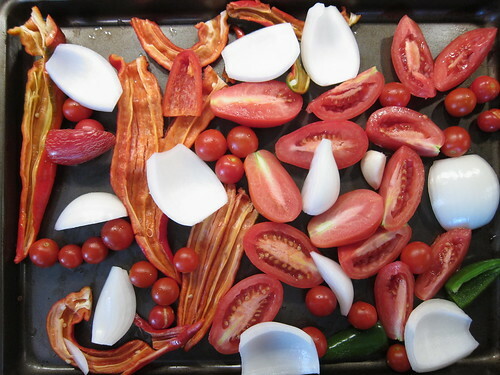 A touch of balsamic or red wine vinegar is good too. One full tray makes about 3 cups of sauce. If we are using it right away, it is usually hot enough right out of the blender. Otherwise, I freeze it in 1 cup containers. I've been doing variations on the sauce too. Since we have a ton of peppers in the garden, I've been roasting them up too for a tomato/pepper sauce. Both sweet and hot peppers work. That sauce I only seasoned with salt and pepper. I think it'll be good in Mexican dishes. Finally, I made a smoked version by roasting some larger tomatoes on the smoker. They get a wonderful flavor. You almost think there is a little bacon in the sauce. I mixed the smoked sauce with a little of the plain so the smokiness wouldn't be over-powering. 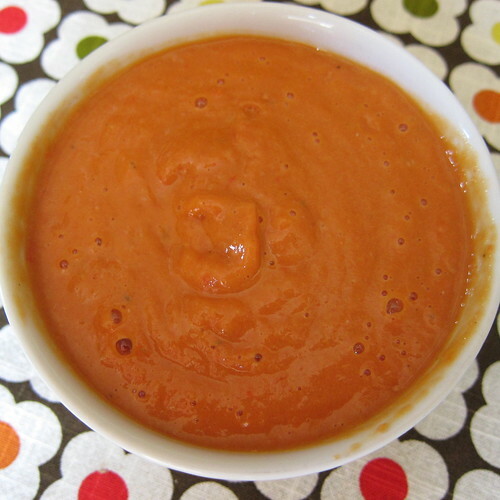 I'll be canning some whole tomatoes in the next couple of weeks for slow cooked sauces in the winter, but in the meantime this quick sauce is my new go-to version. So simple and it makes such a flavorful sauce--I love this! Great idea! 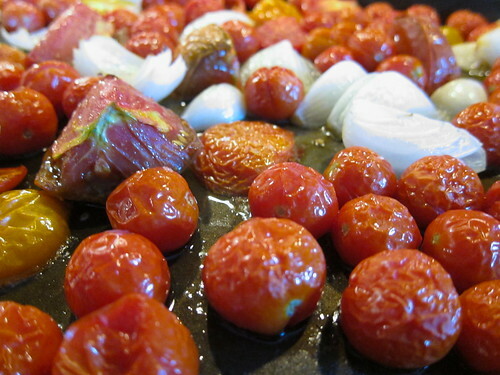 we slow roasted our cherry tomatoes with olive oil and some herbs. They came out liquidy, so we just froze them in ice cube trays. Fantastic idea! I have to try this. Sounds yummy. I bet the flavor is incredible. We made this sauce tonight, and it was fantastic!!!! !Thank you for demystifying the whole thing! I used your idea for tonight's dinner, simmering the sauce with some browned pork sausage after pureeing. It smells really good! Thanks for the idea! Jess - I'm so glad. Hope you have a delicious dinner. 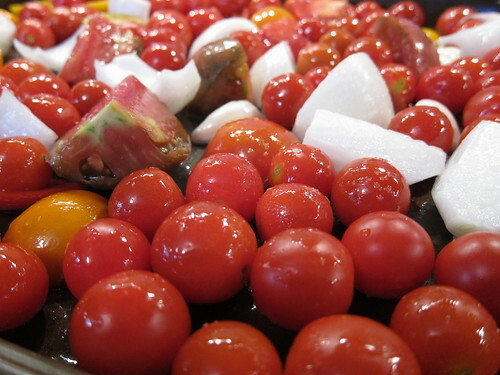 Love that shot of the roasted tomatoes! I've got a lot put up in the freezer this year. It is so great to pull it out for fresh sauce in the middle of winter! Looks so good! I have been slow roasting tomatoes like crazy this year and just freezing them as is, I am going to have to make sauce with some! Yum yum! I just tried this tonight and it was wonderful! The color was pretty, too. Thanks! Yum! I made this with tomatoes from my CSA and it was ridiculously easy and delicious! Thanks for sharing!